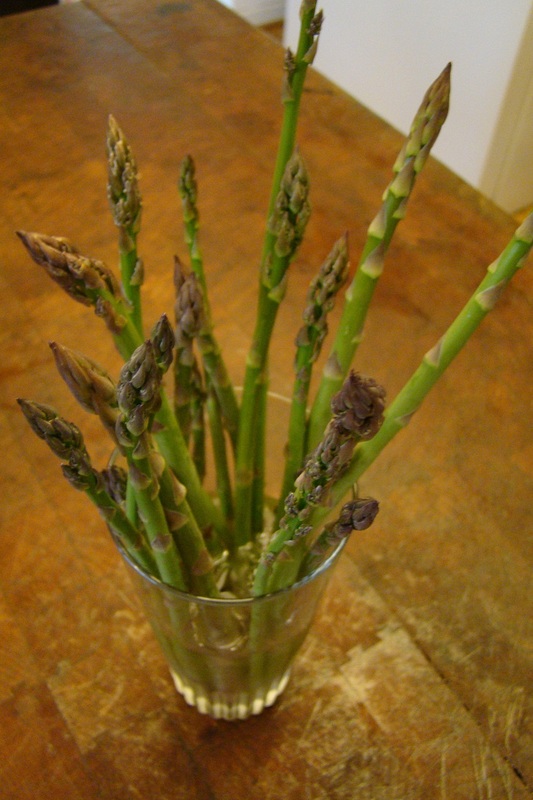 Asparagus came early this year, but I’m not complaining! By the time the Farmer’s Market opens next month it will probably all be gone. More for us! Bacon wrapped asparagus with Siracha dipping sauce. Yum. Why don’t you just stick a fork in my eye, you mean girl!! I AM SOOO JEALOUS!!! I will have to be content to pay $2.39/lb (on sale) for my asparagus. I was convinced ours was going to come up early too. Monday I went hunting and only found one stalk. Either someone got there before me or it is just starting. I went and bought some early greens from shop that sells products from local farmers. Too bad your zone is too hot to grow your own, Gloria. Ours hit full production about a week after we found the first stalk, Bonnie. You’ll be swimming in it soon enough! Do you ever have extra? We freeze ours to add to risotto in the winter.